The advantages of using solar energy in a sunny region like Andalucía, the place with the most hours of sunshine in Eurpoe, are indisputable. Some of the renewable energy installations that have the highest yield are thermal hot water, wind and photovoltaic. This article focuses on the latter, adding that taking advantage of this natural, indigenous resource is not just a luxury, it would be an energy-dependent recklessness to ignore it, as a worryingly high percentage (80%) of external energy use also contributes alarmingly to the greenhouse effect. Those in remote areas, completely isolated from the mains and are used, usually, to supply 100% of the energy required. In some cases they might be supported by other renewable sources such as wind or biomass or fossil fuels to run a generator. They are typically far from the grid. The second type are installations connected to the grid, often called solar farms, are designed to feed in all the energy produced into the electricity network. But what we want to discuss here is another option: small installations in homes or small businesses that are able to generate all or part of the energy they consume, while any excess is fed into the system – this is known as ‘net metering’. While these installations are not yet regulated in Spain, they are being developed in othe European countries like Germany, Italy, Belgium and Denmark, as well as Japan, the U.S., Mexico and Brazil. Here the system feeds into the grid any unused power and if the system does not produce enough it takes from the grid. Subsequently, a balance is created between what is fed into the grid and what is consumed and the consumer only pays for the difference. Technically, this is a viable option, that would allow the country to achieve greater independence from outside energy suppliers like Algeria, one of our largest suppliers of gas, who is ina state of conflict. It would also reduce the environmental impact of fossil fuels, be more efficient, create new skilled jobs and generate wealth. Another benefit would be to make consumers more aware of energy as they become consumer-producers. There would be further energy savings as less is lost through the distribution network and there is more security in having thousands of small scale producers. If then it is as simple as it seems, why has it not been adopted by Spain to establish itself as a world leader in this kind of installation. Instead there are endless barriers being put up to prevent it from happening. Could it be that the current government is more interested in protecting the interests of the big business power companies and even if they do regulate it the conditions will be such that it will no longer be viable in most cases. We must also add the lack of information and interest of society as a whole, who needs to apply pressure to get these kinds of systems established by law to help every home and small business set them up. 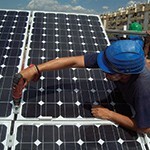 This entry was posted in Whole Earth and tagged eco living, renewable energy, solar, transition towns. Bookmark the permalink.